This photo shows Starbucks' cups with a new design at a Starbucks coffee shop in New York on Monday, Nov. 27, 2017. The company unveiled three new drinks on Dec. 27 to ring in the new year. Starbucks is ringing in the new year early, debuting its festive and party-ready Black and White Mocha Collection on Wednesday. The coffee chain is launching three new drinks, and though black ties may be optional this holiday season, Starbucks said on its website, "the chocolate decadence is a must." The collection includes the signature espresso by the same name, the Black and White Hot Chocolate and the Black and White Frappuccino. Each features swirls of dark and white chocolate mocha, whipped cream and so-called "chocolatey sequins," or chocolate shavings, straight across the top. Starbucks has a history of celebrating the holiday season in style. Its now-famous annual holiday cup debuted in 1997, in what Starbucks said was a magenta color, and the iconic red cup hit shelves in 1999. For the 2017 season, Starbucks unveiled the very first color-in holiday cup, giving customers the opportunity to personalize the vessels themselves. The white cup has designs of presents, snowflakes and a Christmas tree with a star on top. "We love the idea of everyone making this year’s cup their own," Leanne Fremar, executive creative director for Starbucks, said on the company's website. 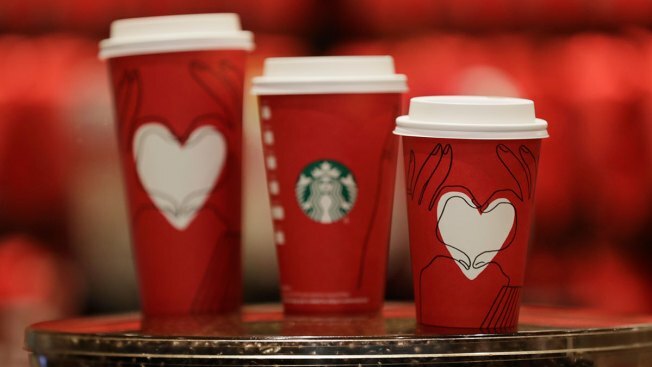 A red holiday cup with a white heart was later added for a limited time during the 2017 season.